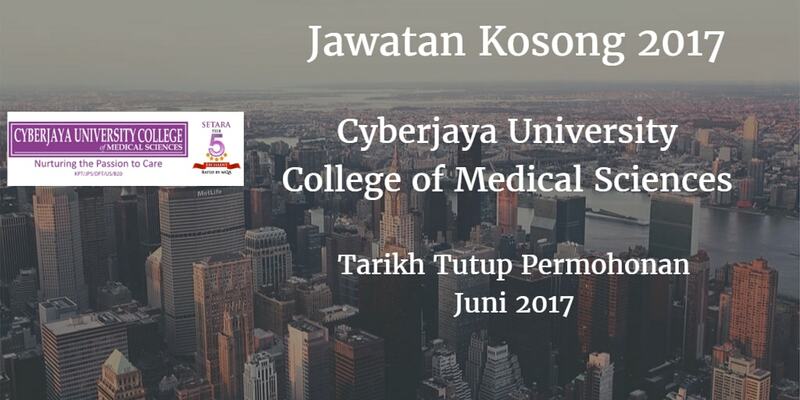 Cyberjaya University College of Medical Sciences terkini terbuka sepanjang tahun 2017. Sukacita dimaklumkan bahawa terdapat pelbagai kekosongan jawatan Cyberjaya University College of Medical Sciences akademik dan bukan akademik berikut. Peluang kerjaya di Cyberjaya University College of Medical Sciences . Cyberjaya University College of Medical Sciences would like to invite qualified candidate to fill in below vacant position vacancy. ability to plan for faculty growth & business needs. Pharmaceutical Sciences, Business & Management.